Tanner Richard spent his childhood looking up to Steve Yzerman. So it was only fitting that the hockey hall of famer and current general manager of the Tampa Bay Lightning welcomed Richard into the National Hockey League this past summer. Tampa Bay used their third pick in this year’s NHL entry draft to select Tanner Richard from the Guelph Storm, and for good reason. Richard capped off his rookie campaign finishing fifth in Storm scoring, notching 48 points in 43 games in a season cut short by injury. Regardless of his injury, the Lightning saw tremendous upside in the Canadian born, Swiss raised playmaker. 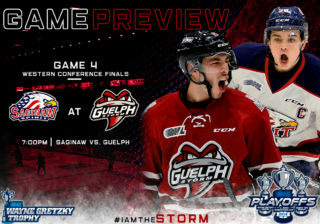 To say that June 22, 2012 was a big day for the Guelph Storm would be a gross understatement, as Tanner Richard joined Storm teammates Matt Finn and Scott Kosmachuk in making the big time. For Richard, sharing that experience with his teammates was a big deal. Draft day marked the start of a busy summer for Richard. While he spent the better part of the summer months training for his sophomore season in Guelph, he also spent a week in Tampa Bay, Florida at the Lightning’s rookie development camp before finally returning home to Switzerland to visit with family and friends. Tampa Bay knew what they were getting when they drafted Richard; a quick-footed playmaker with soft hands and a scorer’s touch who isn’t afraid to engage in the rough stuff. It’s a safe bet that many of those traits were probably inherited from Richard’s father Mike, who played professional hockey from 1986 until 2007 making stops in the AHL, NHL, and Swiss league along the way. According to Richard’s mother Christi, Tanner didn’t get his start on the ice like most other kids. Christi Richard also remembers just how hectic those early years could be. Richard had no shortage of role models growing up, either. In the midst of an extended NHL lockout, Tanner Richard doesn’t know what the future holds. In the meantime, he’s distraction-free and 100% focused on winning games for the Guelph Storm. Second in Storm scoring this season, Tanner Richard will have to continue to lead by example if Guelph hopes to come out on top of a stacked Midwest Division. It’s obvious to anyone that knows Richard that he’s up to the challenge. Storm Stories is a Guelph Storm original weekly feature for the 2012-13 season spotlighting current Storm Players and giving readers a behind-the-scenes look at the player’s lives on and off the ice.